Seaside Farm Market offers a large variety of fresh, local seafood. See below for which local fish you can expect in-season and descriptions. Cat Fish- This fish is white, flaky, and mild. It is great fried, grilled or baked. Cobia (Seasonal) - Cobia has a very white, flaky texture and is typically not a very oily or high fat fish. This makes the fillet great for cooking in a variety of ways, as it takes on the flavor of additions very well without an over-riding fishy flavor. The fillets are also excellent for sashimi. Cod (Atlantic)- U.S., Atlantic Cod is lean, has flaky texture with a mild delicate flavor. 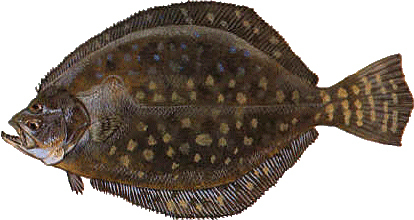 Flounder (Local)- Flounder fillets are thin and small with a milky color that cooks up white. The mild delicate taste of Flounder is sweet and has a delicate texture with small flakes. Sauté, poach or stuff. Halibut (North Atlantic)- Halibut meat is firm and very white. It has a mild taste and is very lean. This fish can be cooked in any manner, but when over cooked, it can easily dry out. Mahi Mahi (Local)- The raw meat is pinkish to off white in color and has a mild taste similar to tuna or swordfish. The meat has a finer texture and large flakes. Grill, fry or bake. Red Snapper (Atlantic) - The raw meat of Red Snapper is white with a pinkish tinge and always has the red color skin. Red Snapper is mildly sweet with a lean, firm moist texture. Fillets are skin-on. Rock Fish or Striped Bass (Seasonal) - Moderately fatty, wild striped bass has a rich flavor and a large, firm flake. The farmed version is milder, has a nice texture, and is more readily available and consistently fresh. Substitutes for striped bass fillets include salmon, halibut, black sea bass, and cod. Salmon- Salmon has a flesh color that can range from red to orange, but cooks up a light red. Salmon flavor is mild to taste, slightly oily, but moist with large flakes. Seabass (Local when in season) - Sea bass has a mild, subtle flavor with a buttery texture quite similar to that of chicken, although the taste varies from mild to medium depending on its type and the cooking method. Whether grilled, baked, broiled or pan-seared, sea bass is moist and flaky when cooked properly. Shark Black Tip (Local) - Thick large flake, meaty flavor, and moist flesh. Cut out any dark meat before cooking shark. Leave any skin attached, as it helps retain moisture during cooking. But the vitamin-rich blacktips have also long been a staple of island dinner tables. The sweet, thick-flaked meat handles a variety of seasonings and preparations and is excellent on the grill. Mako Shark (Local) - Mako shark is moist and slightly sweet, with a full-bodied, meaty taste. Both flavor and texture are similar to swordfish, but the flesh of the mako is moister, and the meat is not as sweet. Fresh, raw mako is very soft and ivory-pink or a muddy, reddish color that turns ivory white and firm when cooked. Sword Fish (Local) - The swordfish is a wonderful fish to eat and serve. It's moist and flavorful, with a slightly sweet taste. The firm and meaty texture allows the fish to be particularly rich and juicy. This prized fish has a flesh color that will vary from pink, white, gray, orange with diet. Beige when cooked, Swordfish steaks are lean, slightly sweet and firm. Grill this one! Tilapia- Tilapia fillets are white with a pinkish tinge. Similar to Snapper or Flounder, the flavor is mild and distinctive. The texture is lean, firm and moist. Tuna, Yellowfin (Local) - Firm, light meat with full flavor. Lean fish. Tuna is best for grilling or searing cooking applications. It is best served as sushi or cooked rare to medium-rare. Wahoo (Local)- One of the fastest swimming fish, Wahoo, called Ono in Hawaii, fillets are long and slender. Off-white to pinkish in color, Wahoo cooks up very white and has a firm, lean, distinctive flesh. Do not over-cook!